A huge development site for retail and leisure amenities set around the HS2 Interchange Station has been revealed. Arden Cross, a landmark development site near the key UK Central investment area has gone on show at MIPIM 2016. Arden Cross covers some 350 acres near Birmingham Airport, Birmingham International Railway Station and the national motorway network in Solihull. 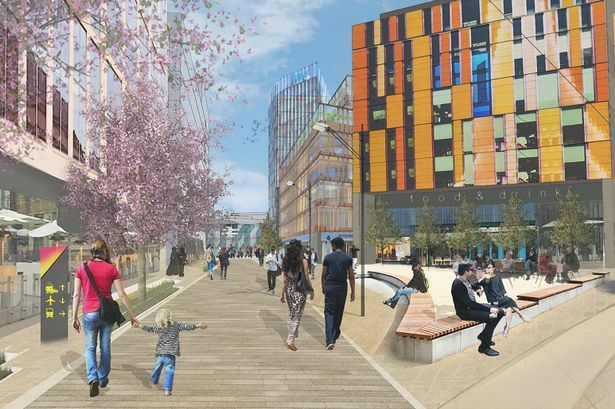 A masterplan has been launched for a mixed-use development, including 2.65 million sq ft of commercial space, more than 2,000 new homes, shops and leisure amenities. The area will be perhaps the best connected part of the UK, with an estimated 21,000 passengers a day expected to use the HS2 station in 2026. The vision for the site is being driven by the Arden Cross Consortium, a group of four landowners. Ben Gray, from the Arden Cross Consortium, said: “Arden Cross is a destination at the heart of a global network of road, rail and air connections placing over 35 million people in the UK within a two hour travel time. Arden Cross is part of Solihull’s UK Central growth plans – a strategic vision centred around four economic opportunity zones, designed to maximise Solihull’s role as a powerhouse of the regional economy. Councillor Ian Courts, deputy leader of Solihull Council, said: “The launch of Arden Cross is a key milestone in the journey of development plans around the High Speed Interchange site and plans around Solihull’s UK Central hub area, capitalising on proximity to assets such as Birmingham Airport, the National Exhibition Centre and Jaguar Land Rover.